For many, the goal in resolving conflict is to see two people, or two parties, get along with each other again. It’s far bigger than that. When I met with Jim and Nancy their marriage hung by a thread. Even counseling sessions seemed to weaken that thread. It threatened to snap any moment. Every word, every defense, each accusation seemed to harden further their feelings toward each other. I wanted to say it out loud, but knew I shouldn’t. You mean there was a time when you two actually loved each other? We met for months and the only thing keeping them going was their commitment to me. Little, if any commitment existed to each other. I wanted to give up, and almost did. The idea came to me on the day they showed up to tell me they had made the decision to move apart. I felt defeat. I failed them and began to lose hope, too. We sat across from each other with only silence filling up the space between us. I finally spoke. Jim and Nancy, I want you both to get on your knees and face each other. Let me be honest here. Given the climate in the room, this was the last thing I expected them to do. Evidently, they still trusted me, still clung to some hope, so they did what I asked them to do. I then leaned forward and continued, sensing another presence in the room. Now, look at each other and repeat after me. Nancy, you first. She was looking at me and nodded slightly, then turned her head to face Jim. I thought I saw the first gatherings of tears lining the edges of her eyes. Okay, you ready? She nodded again, still facing Jim. He could not make eye contact with her, yet, but she continued to fasten her eyes on his. And for the next few moments I had her repeat the wedding vows exactly as they were said ten years before at their wedding. Earlier that morning I had pulled out the notes from my files. I am the one who officiated at their wedding. I asked Jim to do the same. Three lines in, his eyes were locked on hers. Four lines in, she was sobbing. I then reminded them of what else they said as an appendage to their vows. How they were committing their lives for a larger purpose than their own. By coming together, they promised to show a broken world what the cross does in bringing two people together, who exist in harmony as an exhibition of the glory of God. When it was over, the two were embracing. Both were crying. I sat back, amazed. Wondering what just happened. Something beyond me, bigger and more magnificent than what I can explain with mere words. Jim and Nancy walked out of that room holding hands. They have been madly in love since. And that was five years ago. What did happen in that room? Well, first I have to admit, I gave up. Nothing worked. Recommending books on marriage, attending that marriage conference, doing homework together all seemed futile against the strong grip of anger and bitterness that now seemed to define their relationship. Secondly, what happened in that room was supernatural. The moment I asked them to repeat their wedding vows, the Holy Spirit stepped between them to make room for his friend, Jesus, who invited them to meet again at the cross. There, at the cross, something happened that I cannot really explain. The gospel took over. Far beyond repeating wedding vows, he spoke to them again of his death, burial and resurrection and the reconciliation power that defined it all. This became more than two people finally deciding to get along. It became about three people, Jesus in the middle, interacting around the greater purposes of God. That the reason they must become reconciled had more to do with the power of the cross than mere words. See, I am trying really hard to tell you what took place that afternoon, but I am stumbling to do so. All, I can tell you is my approach to helping couples deal with conflict has changed. I don’t always ask them to repeat their vows to each other, but I do talk a lot about the cross of Jesus and what happens when that becomes the altar where we meet. When the goal in helping hurting people is simply that they get along, we fall way short of what God wants. We stop short of the cross of Jesus. When hurting marriages stand at the cross they are reminded of why Jesus came. To reconcile us first to God. And then the power that brought peace where there had been enmity in that relationship can overshadow and over power all broken relationships. 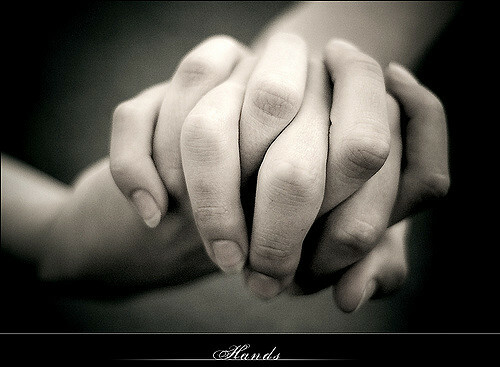 We desire to be restored to one another because that becomes the best way to celebrate the greatest relationship ever. And the world needs to see what that looks like, and it looks best in the image of an embrace, with the cross in the background, than it does in the posture of anger and bitterness where the presence of reconciliation is absent. Paul reminds us in Romans 15:5-7 how the purpose of coming together goes far deeper than being reconciled to each other. It’s so that, together, you both may bringing honor and glory to him. Where the motivation for getting along is the gospel not just your peace of mind. May the God of endurance and encouragement grant you to live in such harmony with one another, in accord with Christ Jesus, that together you may with one voice glorify the God and Father of our Lord Jesus Christ. Therefore welcome one another as Christ has welcomed you, for the glory of God. Let’s never give up on what Jesus can do, and continues to do, for those in broken marriages. He uses the miracle of restoration to point again to what he came to do for all mankind. That was beautiful. It reminded me of the beauty of when Liana and I were married with you Mitch, Jesus, and a church full of friends and family. And we are still very much in love. Thank you Mitch for this article!